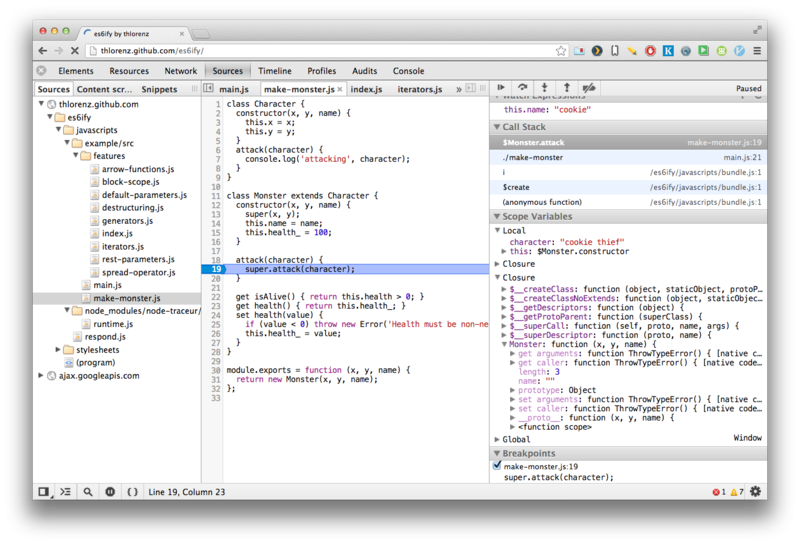 Open your dev tools and look inside the Sources tab and/or the Console to see the results. Make sure to use a browser that supports source maps and to enable them in the settings. Most examples are derived from the traceur language features. You may have to refresh the page a few times after opening dev tools. Find the full version of this example here. The runtime is quite large and not needed for all ES6 features and therefore not added to the bundle by default. See this comment for details. Allows to override traceur compiler defaults. The es6ify transform to be used with browserify. Compile function, exposed to be used from other libraries, not needed when using es6ify as a transform. Configurable es6ify transform function that allows specifying the filePattern of files to be compiled. Some features supported by traceur are still experimental: either nonstandard, proposed but not yet standardized, or just too slow to use for most code. Therefore Traceur disables them by default. They can be enabled by overriding these options. For instance to support the async functions (async/await) feature you'd do the following. When es6ify is run on a development server to help generate the browserify bundle on the fly, it makes sense to only recompile ES6 files that changed. Therefore es6ify caches previously compiled files and just pulls them from there if no changes were made to the file. es6ify instructs the traceur transpiler to generate source maps. It then inlines all original sources and adds the resulting source map base64 encoded to the bottom of the transformed content. This allows debugging the original ES6 source when using the debug flag with browserify. If the debug flag is not set, these source maps will be removed by browserify and thus will not be contained inside your production bundle. // A binary tree class. // A recursive generator that iterates the Tree labels in-order. NOTE: Traceur has a pretty bad bug that makes the above code not work correctly for now: google/traceur-compiler#1358. Imports and exports are converted to commonjs style require and module.exports statements to seamlessly integrate with browserify.